Jetpack is an all-in-one plugin that offers lots of useful features in a single package. When using this plugin, you won’t have to install and configure additional plugins for displaying related posts, adding social share buttons, protecting your site from brute force attacks, monitor site downtime, and so on. However, the plugin comes with so many options that most beginners feel confused about which features to use and which ones to avoid. If you are in that situation, you have come to the right place. In today’s post, I will introduce you to the most useful Jetpack modules and show you how to use these to power up your WordPress site. Brute force is one of the most common techniques used by hackers. Jetpack comes with a built-in module to help you deal with brute force attacks on your site. The module will check for suspicious sign in activities throughout the WordPress network and block malicious IP addresses. While the module will be enabled by default, you can manage the additional options by going to Jetpack > Settings > Security. The plugin will show your current IP address along with an option to whitelist this address. Below, you will find a list of all the whitelisted IP addresses on your site. You need to add photos and images to make your website look more attractive. While there is no limit to how many images you can add, there is a catch involved. The more images you add; the more time it will take to load the site. The solution is to use a CDN service that will reduce the load on your server and ensure a faster loading time. Jetpack comes with a built-in image CDN to let you enjoy these benefits for free. This module will also be enabled by default. You can make sure by going to Jetpack > Settings > Security, and checking out the “Media” section. Your website should be available to your visitors 24/7. However, unexpected events like a spike in your traffic, any issue with the hosting company, or any hacking attempt might make your website unavailable. 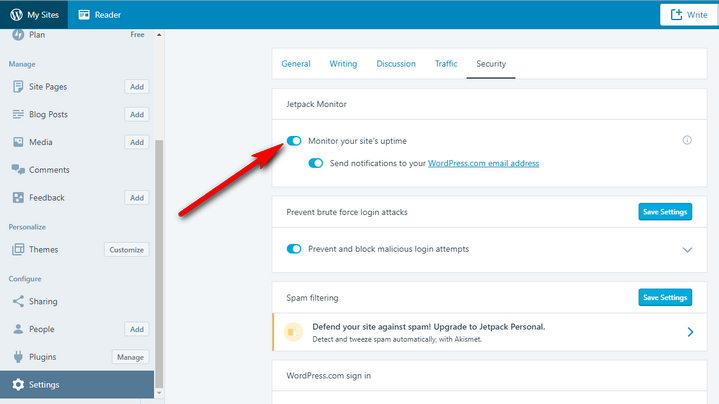 Enable both the “Monitor your site’s uptime” and “Send notifications to your WordPress.com email address” options. This will allow Jetpack to monitor your site for downtimes and let you know by sending email notifications. Displaying related posts is one of the best ways to increase visitor engagement and average session duration on your website. 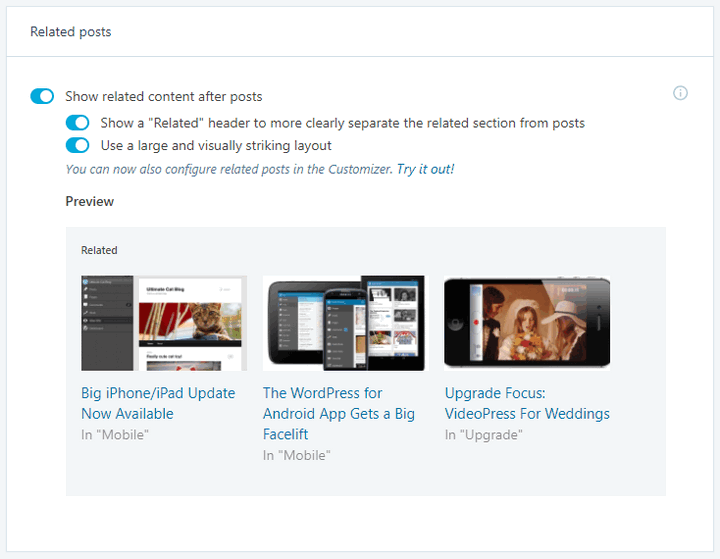 There is a ready-made Jetpack module to help you show related posts. To use the module, go to Jetpack > Settings > Traffic, and enable the “Show related content after posts” option. You will find two additional options below. They allow you to show a title that will separate the related posts from the main content, and to use a large, visually striking layout. Social share buttons enable the visitors to share any content on their favorite social media platform. Jetpack offers a dedicated module to let you display social sharing buttons on your website. You can enable the module from the Jetpack > Settings > Sharing section. Once you have enabled this, you will find the customization options in the Settings > Sharing page. Decide which sharing buttons you want to use, and drag these icons to the “Enabled Services” section. You can choose to display the icon, text, or both the icon and text. It is also possible to customize the sharing label and choose to show the share buttons on the posts, pages, media pages, home page, archive, and so on. Do you want a simple way to keep track of the critical stats for your WordPress site? If you do, Jetpack has a dedicated module to help you. While the module is activated by default, you can configure the additional options by going to Jetpack > Settings > Traffic. 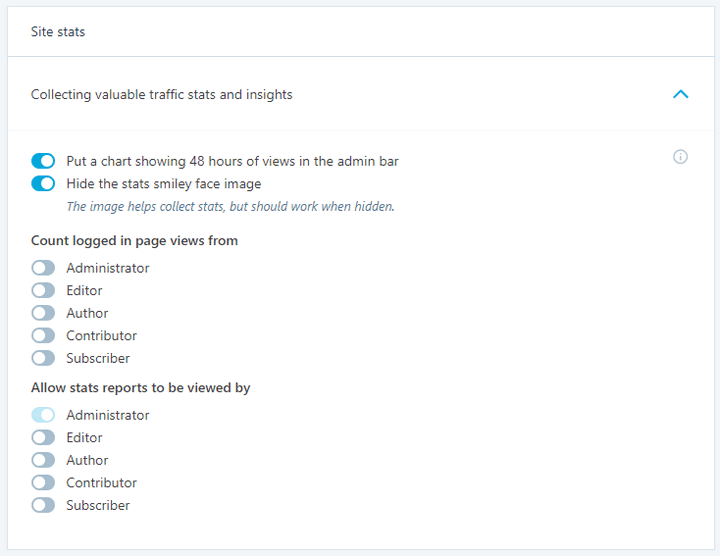 You will find separate options to show a chart in the admin bar, count page views from admins, editors, authors, along with the other user roles, and decide which type of users can view the reports. Go to Jetpack > Site Stats to check out more detailed data like the amount of traffic for the day, week, or month, top referrers, top posts and pages, search engine terms, number of clicks, and so on. There are some occasions when you might want to control which widgets are displayed on the sidebar. For instance, landing pages should not have any widgets, while category pages should display the top or latest posts from that category. Jetpack comes with a dedicated module to let you do that. To view this module in action, go to Appearance > Widgets, and drag a widget to the sidebar. You will notice a new button titled “Visibility.” Clicking the button will open the visibility management options for that widget. You can choose to show or hide the widget based on the rule you set. It is also possible to combine multiple rules for the same widget. Keeping the plugins updated is a crucial task for any WordPress site owner. But updating the plugins takes some effort. And it can be an annoying task if you own or manage several WordPress sites. Jetpack has another module that allows you to enable automatic updates for the plugins. For each plugin, you will find two toggle switches indicating whether they are activated, and auto-update is enabled or not. Enable the “Autoupdates” option for the plugins you want to update automatically. And that’s it. From now on, these plugins will be updated automatically. Jetpack offers so many useful features that it has become a must-have plugin for most of my WordPress sites. Now that you have read this in-depth post, you know which Jetpack features are the most useful and how to use these to power up your website. So, which Jetpack module do you like the most? Let me know in the comments below.